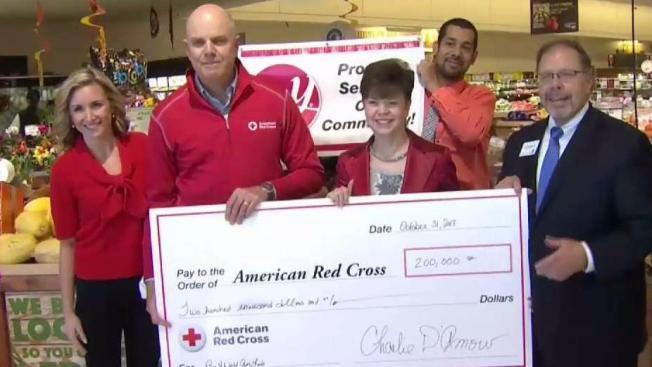 Big Y presented the American Red Cross with a check for $200,000 on Tuesday. The money was raised through collections at its stores. During the month of September, NBC Connecticut partnered up with Big Y to help collect donations for the American Red Cross Disaster Relief. Thanks to the generosity of customers, employees and some corporate help, Big Y donated $200,000 directly to the Red Cross on Tuesday. The money was collected at Big Y locations all across Connecticut and Massachusetts from September 1 through September 23. “It’s just important to be able to connect neighbor to neighbor and bring everyone together to provide support for these causes,” said Charles D’Amour, President & COO of Big Y. From the historic string of hurricanes Harvey, Irma, and Maria, to the thousands of families affected by the deadly wildfires in California, the Red Cross has been working tirelessly to help those in need. NBC Connecticut is proud to partner with Big Y and the American Red Cross when donations are needed most. From our monthlong collection efforts at Big Y locations across the state, to our very own team greeting viewers and helping raise money at the Yard Goats last home game of the season. By the end of the night, more than $18,000 was collected and donated directly to the Red Cross. NBC Connecticut also hosted a phone drive that allowed people to call into our station and make donations directly through Red Cross volunteers. In just 3 hours, more than $27,000 was donated to hurricane victims.